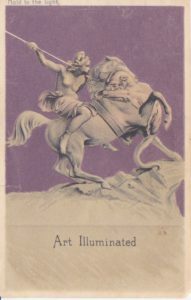 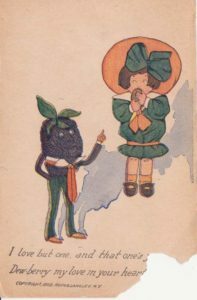 Vedia Eggleston’s Postcard book contained over 100 postcards when Donna purchased it. 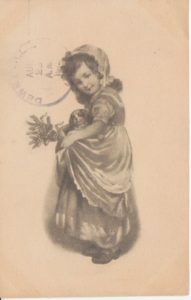 Some cards had already been removed and sold individually. 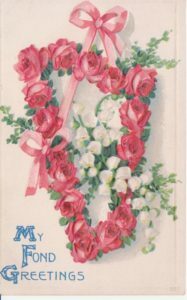 It was quite a collection and gives us some idea of how popular and prevalent it was to send these cards to friends and family. 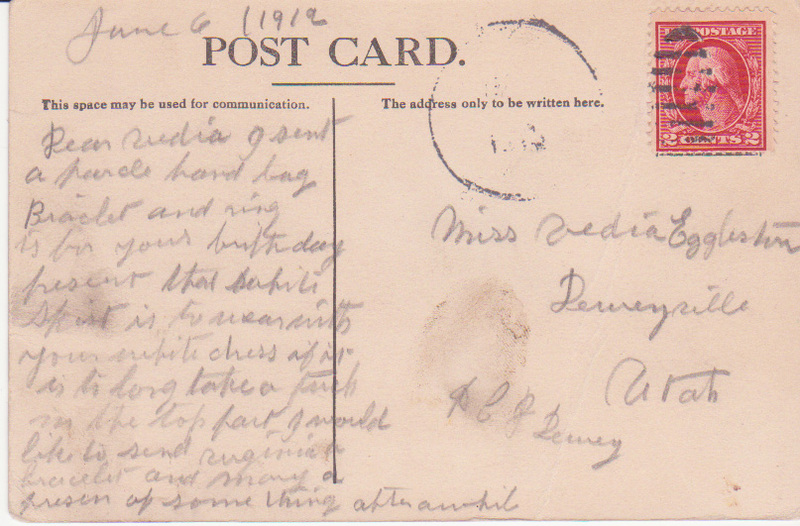 It was very much like texts, tweets and Facebook posts we send today to keep in touch and share updates on our lives. 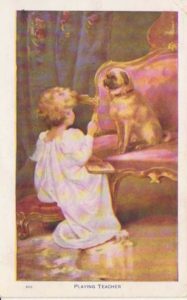 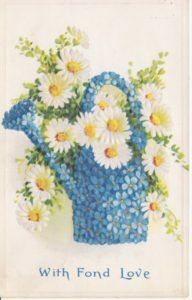 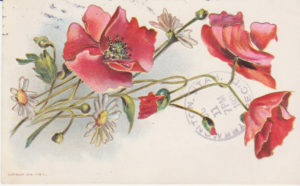 This card was sent from Edith in Afton to Veda who was in Malad. 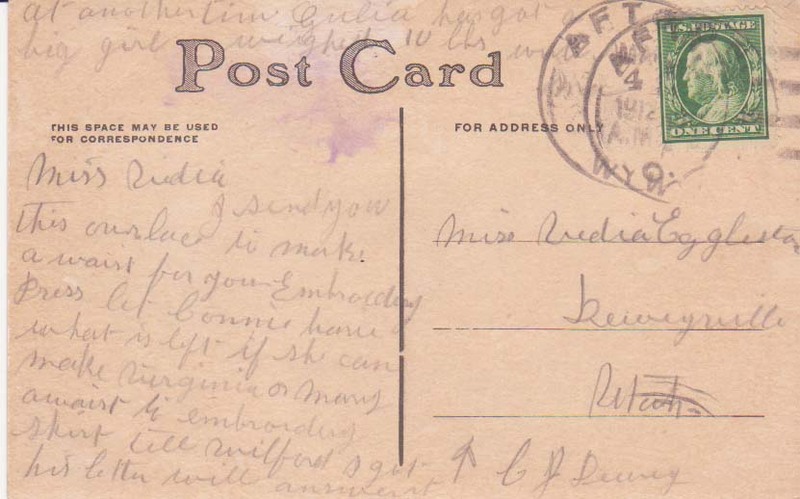 The postmark appears to be 1915. 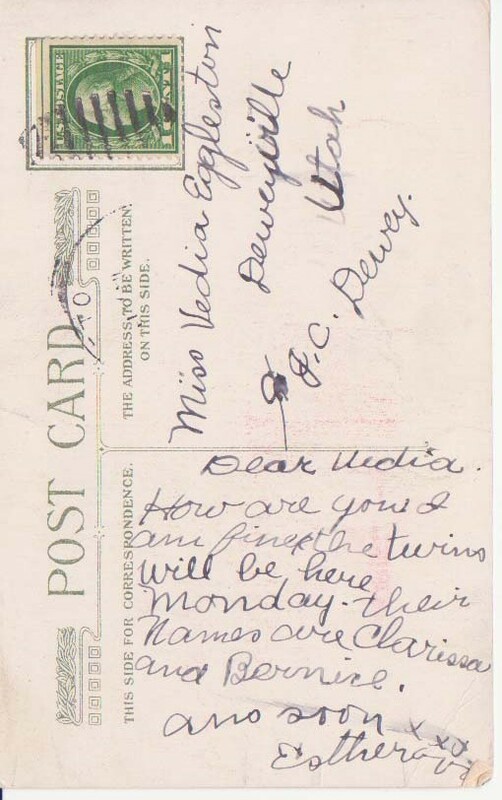 Vedia’s sister Clara sent this card to Vedia, who was with their sister Connie Dewey in Tremonton, Utah. 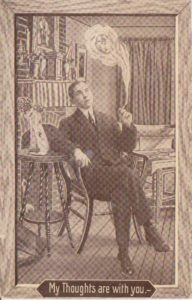 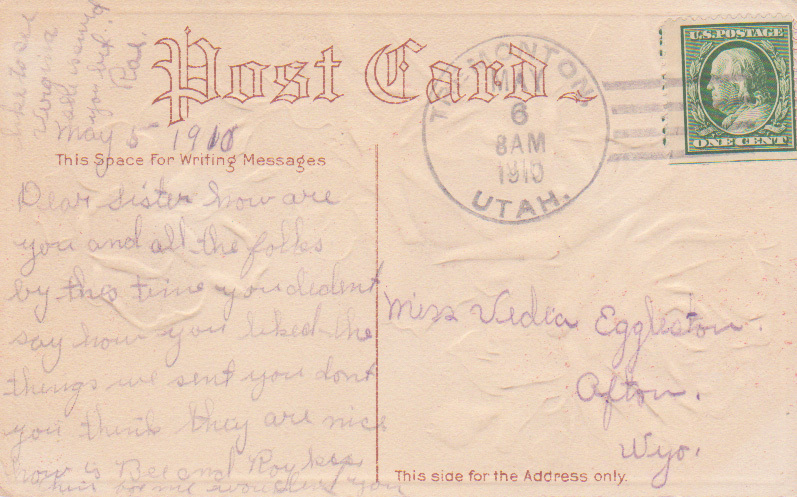 Asa Eggleston sent this card to his sister Vedia. 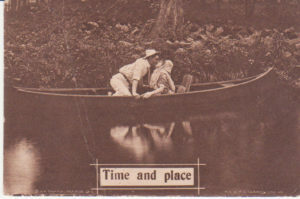 He was in Deweyville and she in Afton. 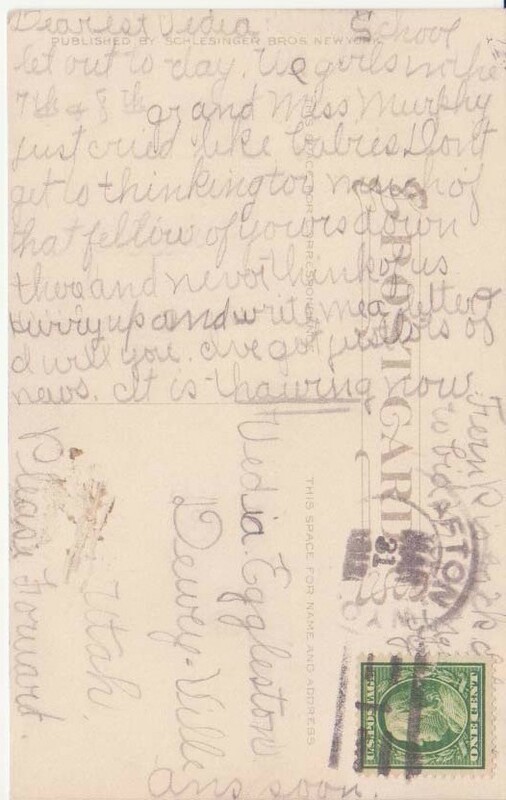 Vedia’s sister Rae sent this card to her in May 1910 from Tremonton to Afton. 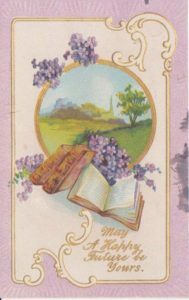 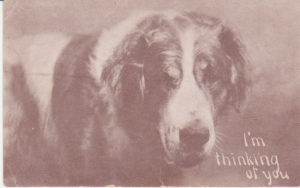 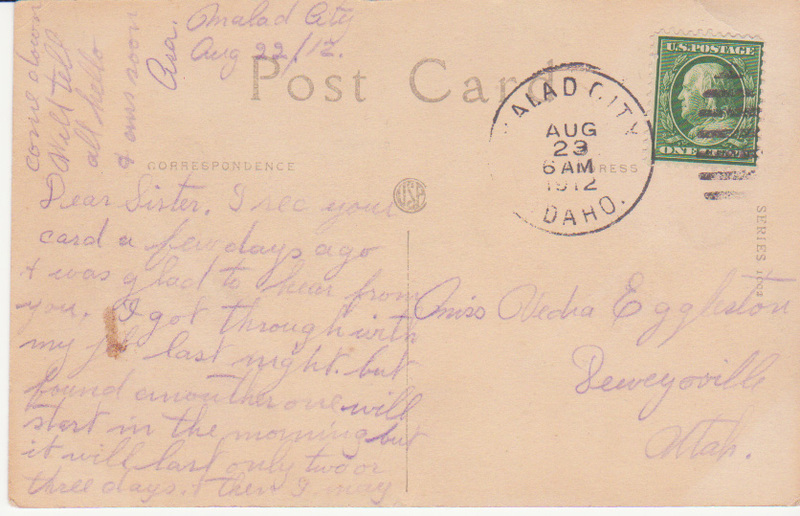 This card was sent to Vedia in June 1912 when she was in Deweyville, Utah. 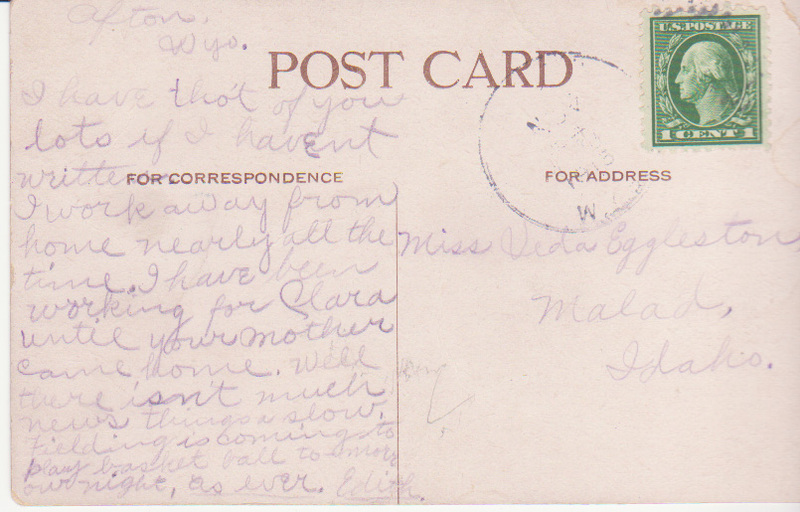 Vedia apparently had been sick with whooping cough when she received this card from John. 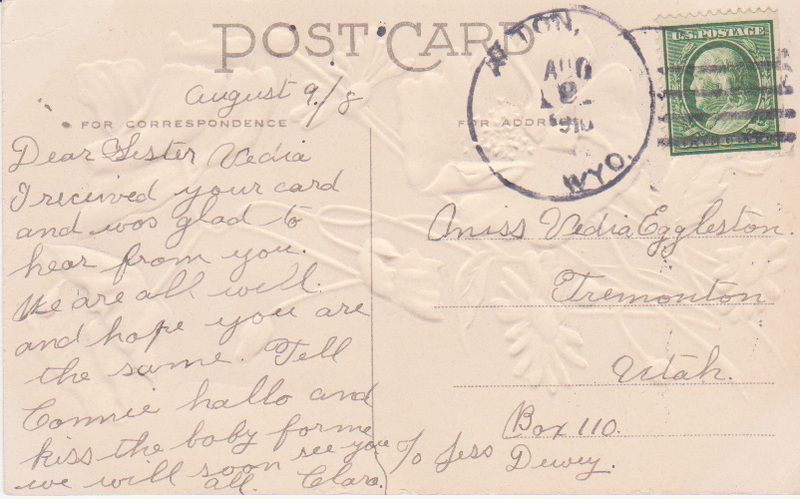 Asa sent this card from Malad to Vedia in Deweyville in August 1912. 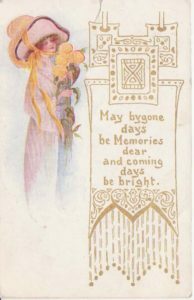 This card lost a corner and a bit of the message. 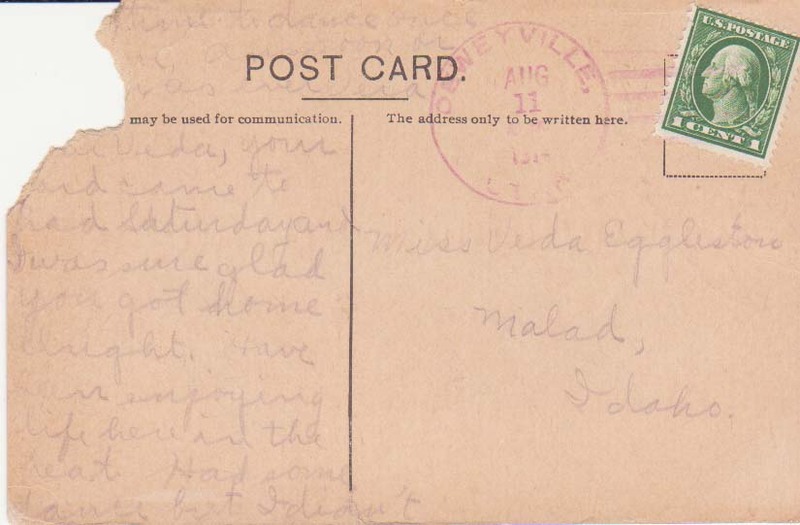 It appears to be from Vedia’s friend Vera from Deweyville sent to her in Malad. 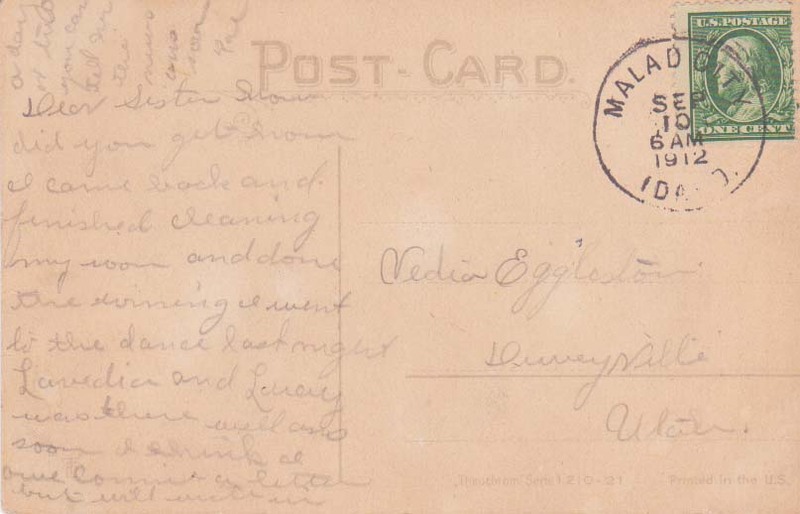 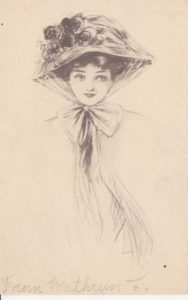 Rae sent this card from Malad to her sister Vedia who was in Deweyville in September 1912. 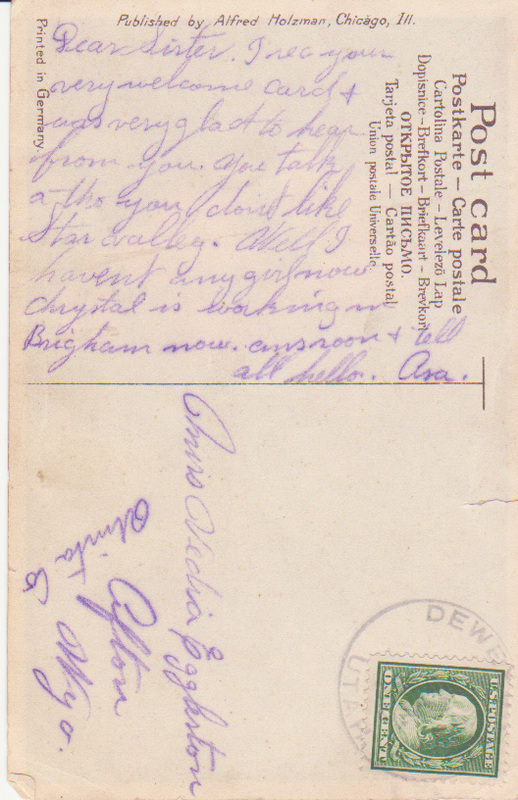 This appears to be another card from a friend, sent to Vedia when she was in Deweyville. 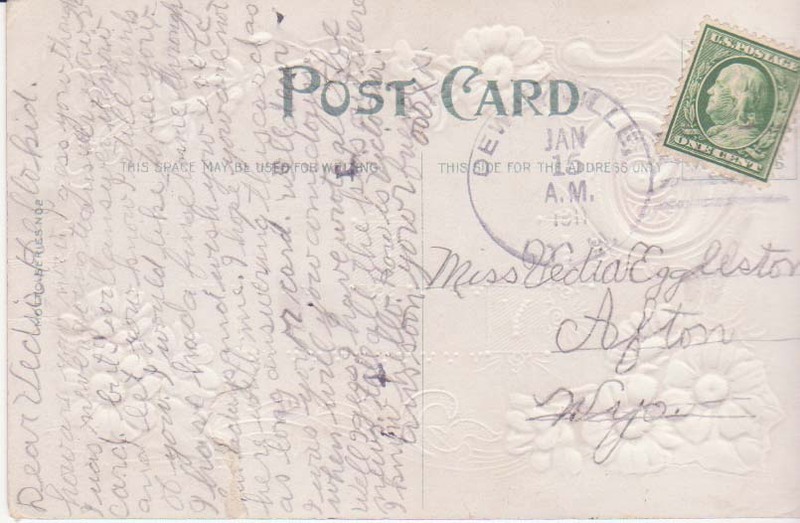 Postcard sent in 1912 from friend Lydia in Deweyville to Vedia in Afton. 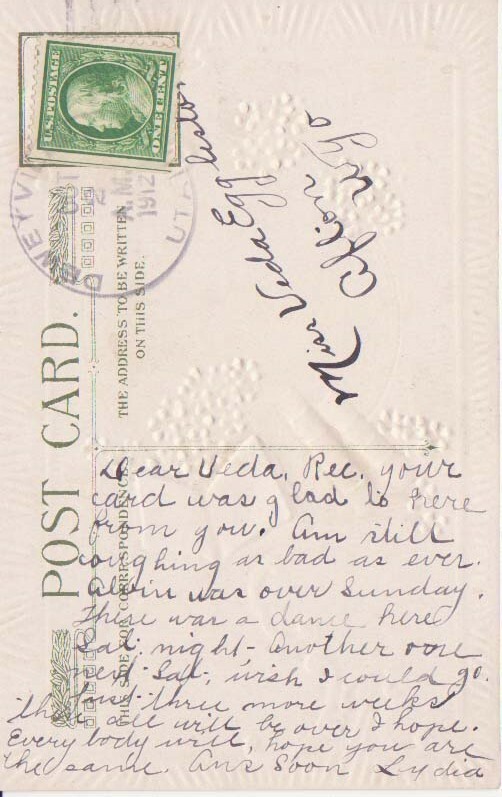 Another card from a friend in Deweyville to Vedia who was in Afton. 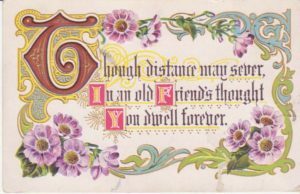 Vedia’s friend Kathryn sent this card to her at the end of the school year. 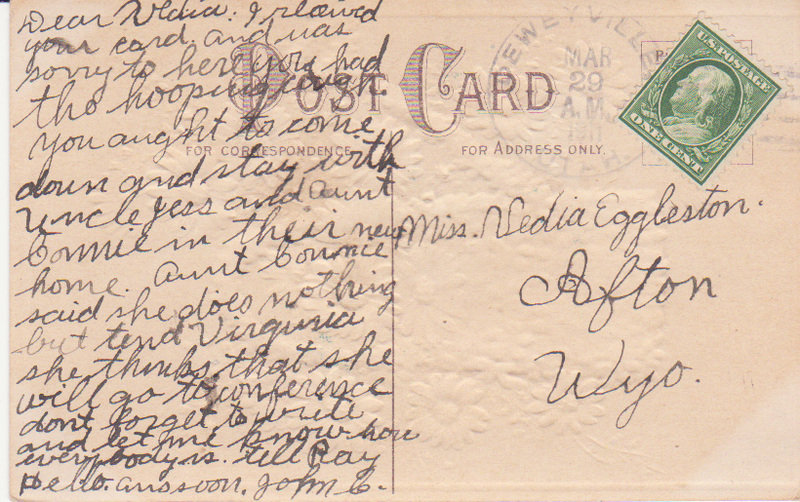 She seemed unsure where Vedia was at that time and requested the card be forwarded if she was not still in Deweyville. 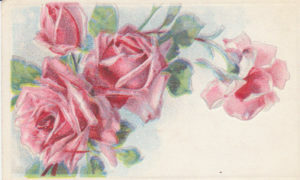 These last two cards were sent from friends in Afton, Wyoming, the last one from Esther. 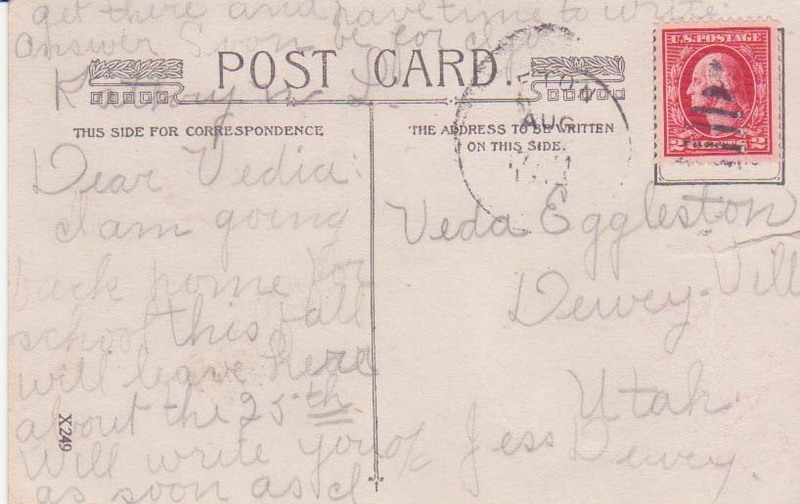 Vedia was in Deweyville with her sister Connie and her husband J. C. Dewey.